Product #3168 | SKU beDI400P | 0.0 (no ratings yet) Thanks for your rating! 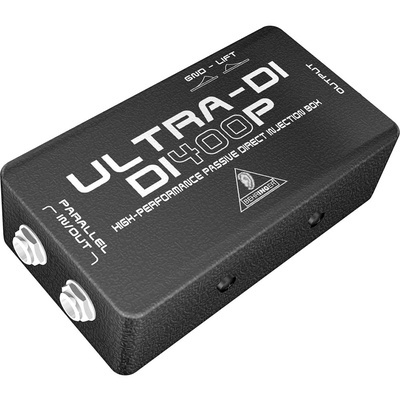 The ULTRA-DI DI400P is a passive DI (Direct Injection) box for connecting a guitar, bass or keyboard directly to your mixer. With the DI400P as your go-between, impedance-matching problems become a thing of the past, and long cable runs will not sacrifice all of your precious tone. With its parallel 1/4" IN and OUT jacks, the DI400P allows you to plug in your instrument and send the same signal to your onstage amplifier, while the XLR OUTPUT sends a balanced signal to your mixer. A ground lift switch eliminates hum associated with ground loops and our high-performance transformer provides the ultimate in signal integrity.